Just thought I would let you know how much we enjoyed our recent charter in Croatia. Your help and support contributed to its success. On behalf of my whole crew thanks. Everyone enjoyed their selves and are keen to do it again next year. The boat (Sun Fast 43) is very well maintained even though it's quite old. You take very good care of this boat so never mind if it was build in 2004. Its equipment is also verry good. All the spareparts are there and a very good first aid kit. I had also good support from the charterbase. 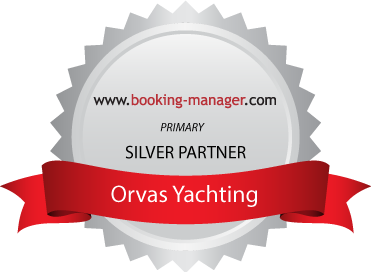 I highly recommend Orvas Yachting and that boat "Opportunity" which we chartered. It 's always a great feeling to navigate between the islands of Dalmatia, with their colors, flavors and breathtaking sunsets. People always available, always careful capable and professional to customer needs. Many thank's for professional work of whole Orvas team. "... Everything was fantastic. Big compliments on the crew (Gulet Barba)!!! Thanks a lot for everything!!" "... Everything went very smoothly and we all felt it was a wonderful holiday - such a gorgeous coast. The gulet (Anamarija) was really lovely and comfortable with a superb crew - very able and helpful and made us feel very relaxed and spoilt!, with delicious food carefully presented. The captain gave us lots of ideas for dinner and took us to beautiful secluded bays as well as stoping off at interesting islands and sights. The owner of the gulet who met us on each Saturday couldn't have been more charming and welcoming. It was definitely one of our most memorable holidays..."
... We are more than happy with service that we had on boat (gulet Barba). Team is really great. Highly discreet, pleasant and, at the same time, professional. I am the most grateful for the whole organization. I have many fond memories in my head!! "...Our stay was fantastic. Croatia is a beautiful country and view from the sea makes it even more spectacular. We had a great time on board. The boat (Mariora 20) is gorgeous and beautifully maintained. It frankly looks brand new. The only one regret is that we cannot afford to come back every year. Thanks a million for all your support during the planning and booking." "…it was again a wonderful 8 days!! 1. We loved the Bavaria 39. It was a very comfortable boat. 4. We arrived slightly early and the cleaning staff was very accommodating to accept our luggage although they were still busy. Again such service and friendliness set your company apart from others. 5. Zoran was excellent to understand the needs of all on board. Women with slight seasickness, men who enjoy pulling up the sails, swimmers, cycllist and those who were less active. He accommodated all of us. Thanks for a strong leader with a warm heart!! 6. The route – again it was Zoran’s knowledge of the sea and the different islands that ensured that every day was different. The Sibenik channel was very special as well as advice visit nature parks, historical buildings and places of interest. 7. Everything we booked was on the boat like snorkels and towels. 8. The administration and communication with us via email was excellent and money transfers happened on the dates agreed. There was no hidden costs and therefore we could plan and budget accordingly. What can I complain about? Nothing really !!! One suggestion a mop (may be with a short handle) or rags to clean the floor or after rain or a swim. It helps to keep the boat clean…." Hello Nikolina. Yes yes yes I loved our gulet loved the other passengers and loved the crew. We would do it again and have given your web page to friends. A minor suggestion might be to have a couple of bikes on board and perhaps some water toys such as a small canoe or kayak. Other than that it was perfect. Thank you for a great holiday and now all my friends know what a gulet is. Hi Nikolina, Thank you very much for the helping us with the holiday. This is our 3rd time and we had a great time once again. Our Skiper was Marko who is simply excellent. We would recommend him with all our heart. Suggestions: The bavarias are getting on the old side and maybe the fleet needs to be updated and have some more high end boats available. We had Bavarija 49 and it is showing its age. Email/communications were very clear and it was very easy to book and organise pick ups. Thank you very much once again! Draga Nikolina, Bili smo vrlo zadovoljni sa cjelokupnim jedrenjem. Nismo imali nikakvih problema s brodom, sve je bilo kao sto je i dogovoreno. Mislav je bio odlican skiper i sigurno nas je vodio kroz nemirno more kojega je bilo dosta taj tjedan. Komunikativan, nenametljiv i zanimljiv su sve njegove vrline zbog kojih smo se i ove godine odlucili da nam se pridruzi. Odlicno se uklopio i dobro snalazio sa svim nasim zahtjevima. Hvala Vama i cijelom timu u Orvasu na organizaciji i profesionalizmu. We had a nice vacation on Your yacht and thanks You again. Please forward enclosed photos to our skipper Joskо. We are back home in South Africa after a stunning holiday in Croatia. What a beautiful country!! Sorry we missed you on the Saturday morning … We want to thank you for the welcoming gift - it was lovely wine and oil and we all enjoyed it . Your coordination of all the admin and other paper work was excellent. Thanks again. The sailing was great. Our skipper Igor was not only very professional but also very skilled and a caring person with an understanding of the different needs of guests. We could not ask for anyone more competent and considerate to skipper and guide us. The boat was in great shape and overall well maintained. u vrlo kratkom vremenu koje sam vam silom prilika zadao. i docekale da bi sve bilo perfektno. brodu i bio spreman da u svakom trenutku pomogne. Ahuge thank you for setting up a vacation of a lifetime for my friends and I. We had Zoran and Marko as our skippers and they were simply amazing!! You are very lucky to have them on your team, and I am convinced our vacation would not have been any where as good without them. We had complete confidence in them at all times and their knowledge of the area is second to none. The service was outstanding and they were always one step ahead of us in terms of our needs!! Thank you for giving us an experience we will never forget!! I want, once again, to thank Orvas for helping us with skipper and a lovely villa. Your help was a big comfort and a support for me. ..zahvaljujuci cijelom Orvas timu i iznad svega Rikardu Blaskovicu - Riki, proveo sam sa jos sedmoricom, sta kolega sa posla sta prijatelja (6 Njemaca/Njemica i jedan prijatelj Hrvat), nezaboravnih sedam dana u nasoj predivnoj zemlji. Iako sam iz Splita i more i nasa obala mi nisu nepoznati, ovo je bija dozivljaj kojeg, iako sam puno zemalja proputova, jos nigdi dozivija nisam. Preko prvih kontakata sa vasim (krasnim, puno lipim) curama iz biroa pa sve do dana ukrcavanja na Kucarin uvik su bile, bez obzira jeli Ema, Nikolina ili Marija, jako ljubazne, srdacne i profesionalne. A posli ukrcaja vas djelatnik Rikard ne samo da je nastavija u tom stilu nego je ucinija da slijedecih 6 dana na Kucarinu za sve (p)ostanu legendarni. Ljubazan, krajnje usluzan, uvijek nastojeci da nam pruzi informacije o otocima i mjestima gdje smo bili kao i o samom jedrenju, uvijek spreman da nam ispuni svaku zelju kao i da nas svojim salama nasmije, postao je ubrzo jedan iz "nase ekipe". I pored toga sta se sa svima takoreci sprijateljija, nastavio je da obavlja njegovu ulogu krajnje korektno i profesionalno. Jednostavan, nenametljiv, nezahtjevan, sa srcem i dusom moreplovac i "domacin skiper". Da ne duzim, da imam svoju charter firmu odmah bi vam ga oteja i zaposlija kod sebe. Kao i ostale momke kod vas - Marka, Joku, Mislava - njih sam upozna. Zahvalite se molim vas u moje i nase ime cijeloj Orvas ekipi i naravno posebno Riki. Nadam se da cu vec slijedece ljeto uspit skupit ili istu ekipu (tesko je naci zajednicki termin) ili sa par novih ponovo dozivit ono sta je ovog ljeta uslo u legendu ;-). A onda zna se, Kucarin i Rike idu sa mnom, sa nama. Srdacan pozdrav iz hladne Njemacke i puno uspjeha u daljnjem radu kompletnom Orvas-Yachtingu! …Your email has instantly transported me back to a fantastic sailing playground with wonderful memories of 2 of the best weeks sailing I have ever done in my life! … I also attach an article I wrote for our Sailing Club newsletter which you might be interested in. Everyone we dealt with in Orvas was very helpful and friendly and we have been singing your praises to everyone we have talked to about trip. Thanks again for your part in our “once in a life-time” holiday. So, thank you again for everything and wish you succesful season! …we returned from our holiday in Croatia on Saturday and we wanted to thank you all very much. The organization at Orvas was brilliant and everything went very smoothly. We would particularly like to single out Ricardo who did the handover on arrival and departure: he was very helpful and gave us lots of ideas about routes and destinations and was very welcoming. The girls in the office were also very helpful. Please let Marco, the manager, know how pleased we were with his staff. We look forward to visiting you again. Thanks once again. Just to confirm you that everything was perfect with our charter last two weeks. The boat was really excellent – including outboard engine – and we enjoyed very much sailing around Dalmacija. Special thanks to Tomo and the technical staff in Split. Great job. See you next time. …In what concerns to Orvas’ service we would like to point out your professionalism and concern with our trip. Everything was nicely organized and the best skipper choice. Indeed, our words should be mostly addressed to our skipper Domagoj as without him it would not be possible to experienced such a special trip. He is a great skipper (meaning, we felt we could trust him with our lives – which was of most importance to us as it was our first sailing experience). He always advised us on the best alternatives to visit places and despite one day without sailing (due to weather conditions) we could accomplished our planned itinerary. He knows the sea and the islands as he knows his own hands which aimed us to visit amazing/beautiful/unforgettable places… he took us around two wonderful bike tours through Vis and Mljet… that will be in our mind forever. From simple things, we got perfect days and unforgettable moments, the learning how to sail, the swimming, the wonderful bays and scenne, the card games, the cooking… we had a very good time on board, and we felt like a real crew. … We wish all the success for Orvas and Domagoj. Thank you for this unforgettable visit. We enjoyed our week in Croatia and were very pleased with the boat and your service. I have recommended you to friends of mine who you might hear from for bookings next year. I am not sure of my plans for 2008 but will certainly consider you again. We were very impressed with Orvas. We have hired yachts in Australia and Thailand and your service was the best, in the particular the way you looked after us getting a taxi and finding our accommodation after we returned the yacht. WE felt valued! We met a Canadian family who hired a yacht from another company. They had nothing but trouble with the outboard, the toilet, the icebox, he diesel motor etc. We are happy to report we did not have one gear failure or maintenance issue. We are happy to recommend to others that may wish to use Orvas. All the best. We would love to return but not sure what year. „We were delighted with our holiday, Joshco is a wonderful skipper, filling us with local knowledge on the areas we visited. The islands we saw were beautiful and the mixture of sailing and time to see the islands was perfect. Unfortunatly the weather was too calm for us to sail much but that couldn't be helped. We did find the boat a bit too small so would go for a bigger one the next time, and there will be a next time we enjoyed it so much. „The experience was amazing, I did actually e-mail Orvas and thank you and Marco when we got back. He was extremely accommodating and easy going and tried to make the best arrangements possible for us. The yacht, although it was clearly not brand new - was fine and perfectly clean and what we would have expected. We loved Croatia and the islands and can't wait to come back. We would like to come to Dubrovnik and then travel to Miljet and Korcula this time, not sure when exactly, so yes please do include me in your bulletins. „Thank you for e mail. We had a great holiday and thoroughly enjoyed Croatia. The boat was very prepared and we did not have any major problems. The only thing that did cause a minor problem was the sailing manual of the Croatia coats on the boat was in German and no member of the crew could read German. We would have brought our own from the U.K. if we had known one was not available. The marina's on the coast were very good as long at you arrived early. One point I would like to make it the hazard of filling with diesel in Split if the wind is from the south east blowing force 4 or above. It is extremely dangerous as the diesel dock is totally unprotected and I would suggest future charterers be advised that if the wind is in this direction they will not be penalised for not filling up. We would like to receive your news updates and special offers when available. We might well be back next year. Thanks again for your making our holiday so memorable. "We had perfect weather and, of course, the ship.